Two of the top teams in the NHL had an early matinee at the United Center today as the Washington Capitals visited the Chicago Blackhawks. Some say that this could be a preview to a Stanley Cup Final matchup. 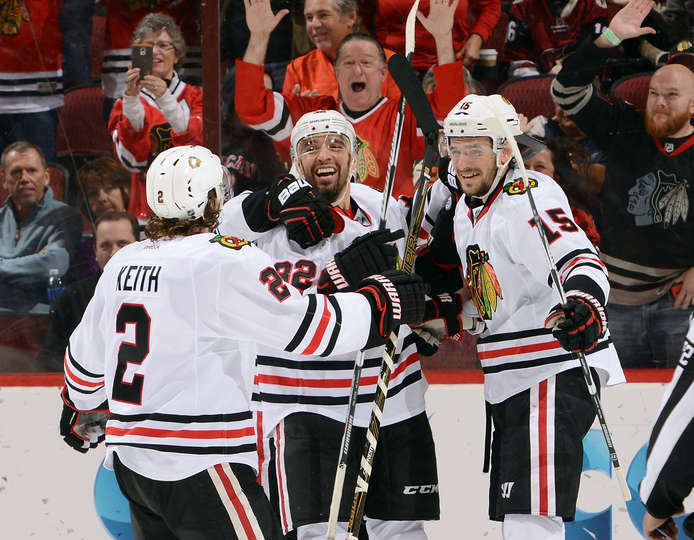 If so, everyone is in for a treat as both teams played tough, but the Blackhawks squeaked out with a 3-2 victory. The 1st period was fast-paced. 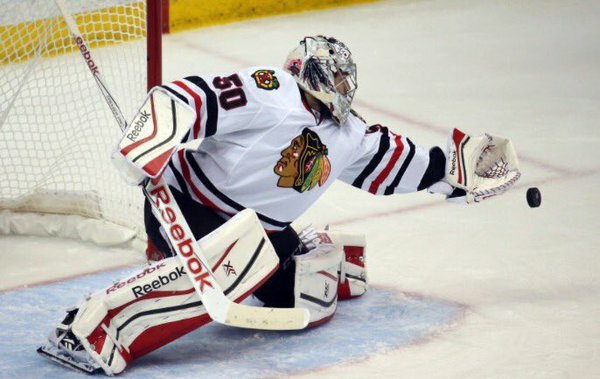 Braden Holtby was tested by the Blackhawks often. The Caps would strike first on the power play as Marcus Johansson, knocked in a rebound of a Justin Williams slapshot from the slot that was initially saved by Corey Crawford, to give Washington a 1-0 lead. That lead would not last long as Patrick Kane knotted the score with a nice deke move in front of the net to slide one by Holtby, just :31 later. The period would end tied with shots favoring the Capitals, 16-6. The 2nd period saw the Blackhawks have a bit more jump in their game as they flipped the SOG advantage in the period by outshooting the Caps, 14-4. The Blackhawks had two power plays in the period, and on the 2nd one, they cashed in. Newly, re-acquainted, Andrew Ladd caused havoc in front of the net, a loose puck went to Teuvo Teravainen, who made a nice pass to Jonathan Toews, who buried it in the back of the net to give the Hawks a 2-1 lead going into the 3rd period. In the 3rd, Washington tested Crawford early and he was up for the challenge. The Blackhawks had to work through a 4-on-3 penalty kill and was able to get through it half way through the period. With just under 8 minutes remaining in the period, a non-icing call turned into a board battle win by Richard Panik, who centered a pass to Dennis Rasmussen who wristed a shot past Holtby to make it 3-1 Hawks. Washington would come back do to two stupid penalties (Too Many Men, Unsportsmanlike Conduct), resulting in a 5-on-3 Power play goal by Evgeny Kuznetsov, to bring the game to 3-2. The Hawks were able to hold off the Caps for the victory. 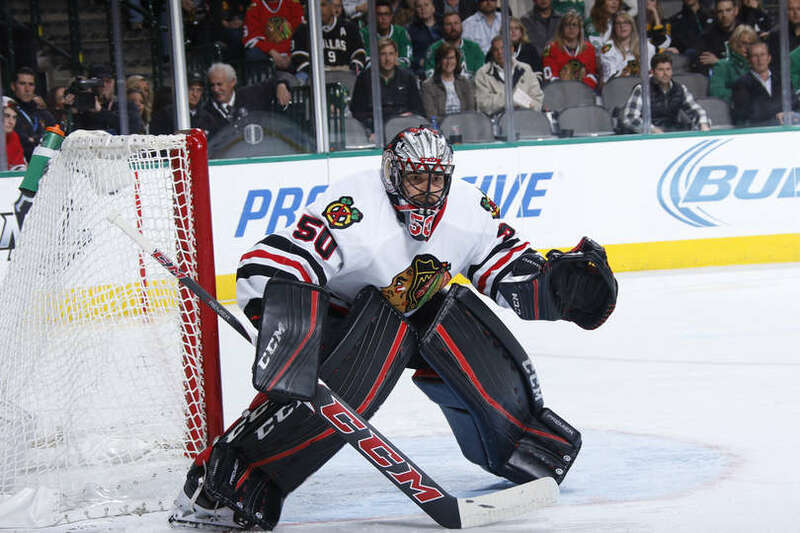 Notable mentions: Corey Crawford tied a career high with his 33rd win on the season. Jonathan Toews was 18-4 at the face-off dot today. Teuvo Teravainen played his first game with newly acquired Tomas Fleischmann and it was one of the most consistent lines for the Hawks today. 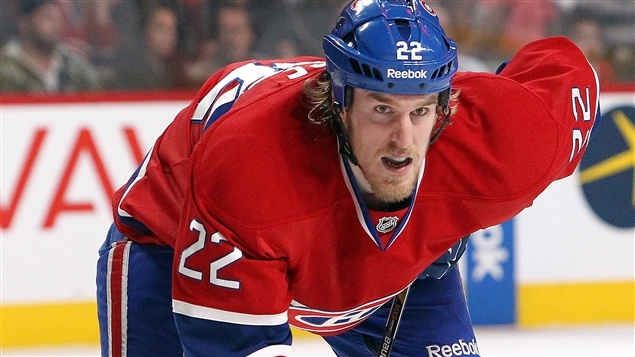 cant wait to see how Dale Weise compliments that line even more. Another day, another two steps closer to solidifying a Championship caliber team for the playoffs. Stan Bowman, pulled off a major trade in bringing back to the Chicago Blackhawks, Andrew Ladd, by sending talented forward, Marko Dano, and the 1st-round pick in the 2016 draft. Everyone was thrilled. The two weaknesses were top line forward, or depth at defense. Bowman went with top line foward. Thank you, Stan. 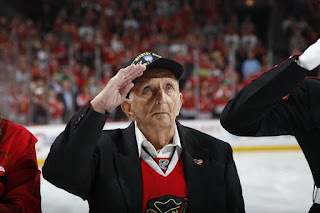 Making any move at a trade deadline is still amazing to this long-time Blackhawks fan when players, and teams would bolt the other way when the Blackhawks came a callin'. Well, Stan wasn't done yet. 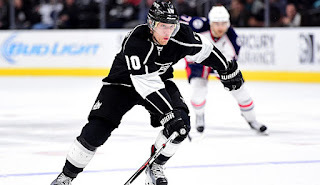 He pulled off a trade mid-day, Friday, as he sent Rob Scuderi to the Los Angeles Kings for veteran defenseman, Christian Ehrhoff. Scuderi, 37, was acquired earlier in the year from the Pittsburgh Penguins, for Trevor Daley. Thigs, needless to say, did not work out well for Scuderi in Chicago, playing in 17 games, registering 0 points, and a -6 rating. 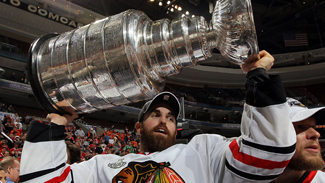 He had been sent down to the Blackhawks AHL affiliate, Rockford IceHogs, to free cap space. Ehrhoff, 33, comes to the Blackhawks as the first German-born player to ever where the Indianhead crest, in the team's history. Ehrhoff played 40 games for the Kings this year, tallying 10 points (2G 8A), and a -10 rating. Ehrhoff will be asked upon to eat up precious minutes come playoff time for the Blackhawks. He has averaged around 14+ minutes with the Kings this year. Blackhawk fans are amazed that Bowman was able to get rid of Scuderi's contract $2.25mil, that extends to next year, in order to make room for anyone else, but with help from the Kings, they retain 15% of Ehrhoff's $1.5mil for remaining of this year. Both team's will split Scuderi's contract for the next two years ($1.125mil). Ehrhoff is an unrestricted free agent at the end of this year. So Bowman did the unthinkable and addressed BOTH needs for the Blackhawks while ducking under the salary cap. Bring on the playoffs! Um...no. Stan wasn't done yet. Later that day, the Blackhawks sent Phillip Danault, and a 2018, 2nd-round pick, to the Montreal Canadiens, for forwards, Tomas Fleischmann, and Dale Weise. Both are unrestricted free agents at the end of the year. 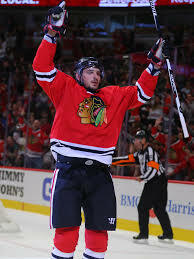 Danault, 23, enjoyed his first NHL career this year by appearing in 30 games for the Hawks and having 5 points (1G 4A). Fleischmann, 31, joins his 6th team in his NHL career. 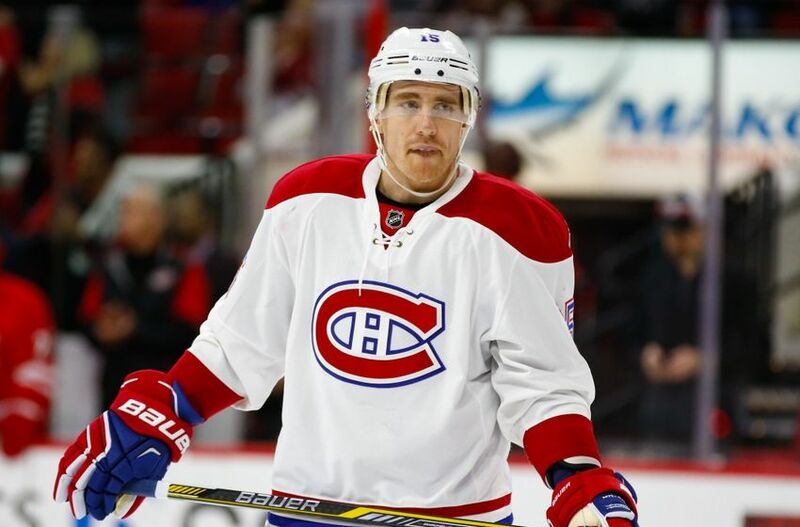 This year with the Habs, he had 20 points (10G 10A) in 57 games played. Weise, 27, played in 56 games for Montreal with 26 points (14G 12A). Both of these players were acquired, according to Bowman, to compliment young, Blackhawks Center, Teuvo Teravainen on the 3rd line. one would 'think' Bowman is complete. The firepower and depth that has been added to this Blackhawks squad has to be having the rest of the league shaking their heads right now. Yet, there are still rumors of Bryan Bickell still being shopped that would clear considerable cap space to bring in another defenseman. With Stan Bowman, who knows!? We will just wait and see what happens. 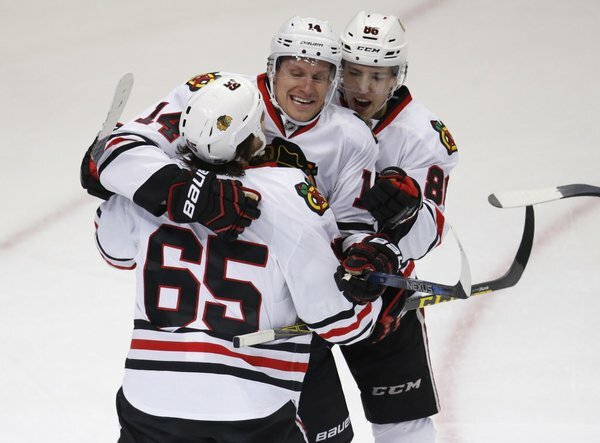 Either way, the Bowman and the Blackhawks are all in to win Lord Stanley's Cup this year. 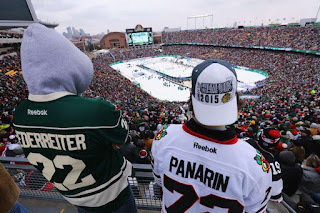 The Chicago Blackhawks were back on home ice tonight after having 3 days off, coming off a drubbing in the Stadium Series at the hands of the Minnesota Wild, 6-1. 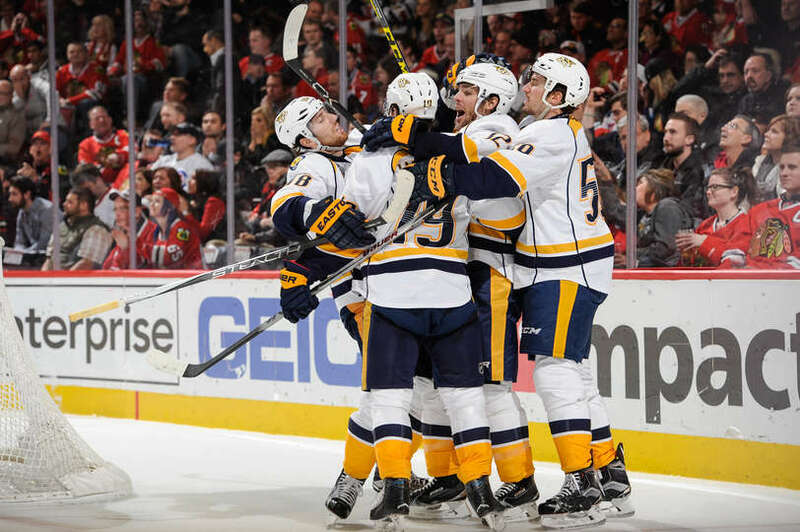 The Nashville Predators swing into town, 7-0-2, in their last 9 road games. Their last loss was here against the Blackhawks back in January. Their road unbeaten streak would continue as they won a goalie battle, 3-1 tonight. The first period saw a goalie clinic as Corey Crawford and Pekka Rinne traded scoring chance save, after scoring chance save. Both teams had opportunities on the power play along with end to end, open-ice chances. The period ended scoreless. 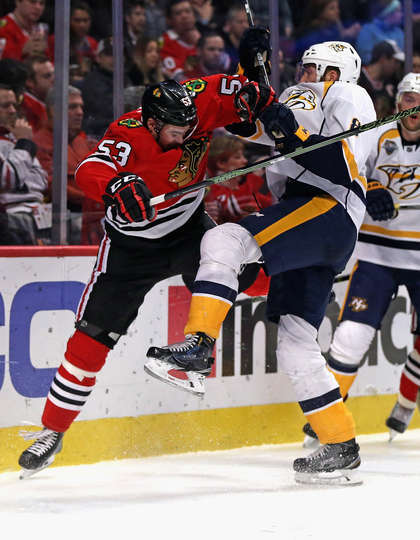 In the 2nd, Brent Seabrook continued his scoring touch when he pinched in and received a centering pass from Jiri Sekac and buried a one-timer past Rinne who had Andrew Shaw drawing traffic in front of the net, to give the Blackhawks a 1-0, lead. It would take Nashville 3+ minutes to find the equalizer as Viktor Arvidsson found a rebound shot from Mike Fisher and smashed it into Crawford, which deflected up and just under the crossbar, to tie the game. The Preds had another chance, but Crawford saved the shot with the knob of his stick, which then flew out of his hand. At the end of the period, Shaw was in alone on a breakaway, but Rinne was there to stop it and end the period with the teams tied at 1. The 3rd period was very similar to the 1st. Both goalies played extremely well. It was a late goal with 1:51 remaining from the stick of Calle Jarnkrok, that made its way past Crawford to give the Preds a 2-1 lead. Miikka Salomaki would add an empty net goal to finish the scoring, 3-1.
Notable Mentions: Jiri Serkac's assist on Brent Seabrook's goal, was his first point as a Blackhawk in 6 games. Brent Seabrook's 12th goal of the season continues his career high, which prior to this year was 9. Stan Bowman's favorite time of year is now. He always looks to better the juggernaut, that is the Chicago Blackhawks, and with the trade deadline coming up, one would think he would be ready to deal. He sent a great message to the rest of the players in the locker room by stating the opportunity to win, is now. The Blackhawks traded young promising star, Marko Dano, the 2016 1st round conditional pick, and 3rd round conditional pick in 2018, to the Winnipeg Jets for veteran, Andrew Ladd, defenseman, Jay Harrison, and forward, Matt Fraser. Ladd fills a hole that was never really filled on the left side of the top line for the Blackhawks when Brandon Saad was traded to Columbus. Andrew Shaw had filled that role for most of the season and had done a fair job. Ladd strengthens that top line tremendously. The former Jet captain this year, in 59 games, has 34 points (17G 17A). For Ladd, it is his 2nd stint with the Blackhawks. He helped them when the 2010 Stanley Cup against the Philadelphia Flyers. 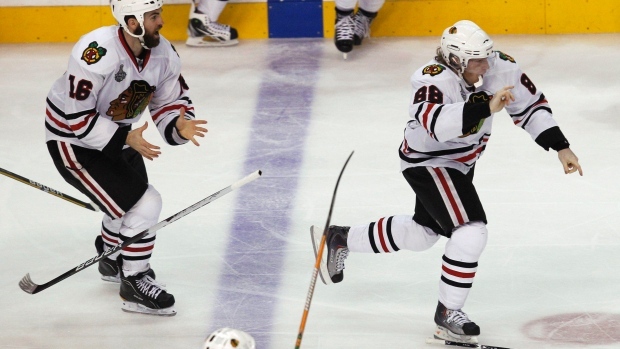 He was on the ice when Patrick Kane scored the game-winning goal. Bowman spent two weeks trying to make this deal happen. Ladd will be a rental as he will become an unrestricted free agent at the end of the year and the Hawks will be in no position to retain him. Harrison and Fraser will report to the Rockford Icehogs, the AHL affiliate of the Blackhawks. Dano, was to be the future replacement for Saad, but he will get more than an ample opportunity with the Jets. In 13 games early on this year, Dano recorded 1G and 1A. In Rockford, in 34 games, tallied 23 points (4G 19A). What helped tremendously in this deal, was that the Jets were willing to retain one-third of Ladd's $4.4million contract, which puts the Blackhawks just under $1million under the salary cap. Who knows if Bowman is done making deals, but one thing is for sure. The Blackhawks are a dangerous team that just got a hell of a lot stronger. Can Ladd's 2nd stint end thlike Versteeg's 2nd stint? The Chicago Blackhawks had a date with the Minnesota Wild in the Stadium Series game today played at TCF Bank Stadium. Some would say the Blackhawks forgot about that date. The Wild came in on fire winning their last 3 games after firing, then Head Coach, Mike Yeo, and replacing him with Interim Coach, John Torchetti, who was part of the 2010 Blackhawks Stanley Cup Team. 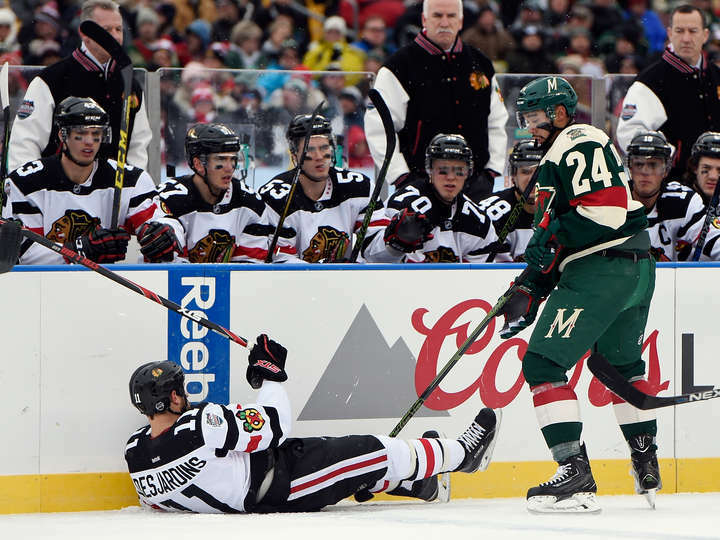 The Wild destroyed the Blackhawks, 6-0, where the Hawks just had nothing to contribute to the game whatsoever. 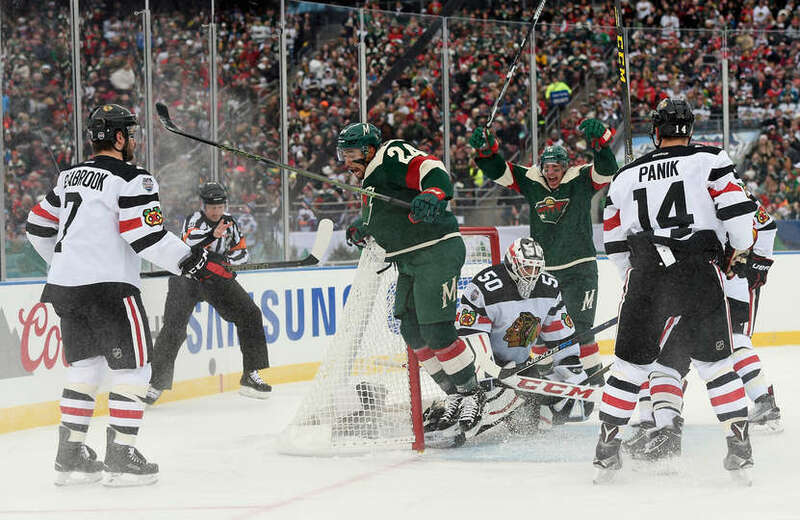 It didn't take the Wild long to find the back of the net as they had a breakaway that was stopped...twice, by Corey Crawford, before two Blackhawks skated by the puck, in which left Matt Dumba, completely wide open to bury the next rebound to give the Wild an early, 1-0 lead. Shortly afterwards, Andrew Desjardins got knocked on his backside with a clean hit, but Phillip Danault took exception to it and drew a penalty. On that power play, two Wild players were in front of the Hawks net. Thomas Vanek deflected a Jason Pominville shot past a completely screened Crawford to give Minnesota a 2-0 lead. Things when settle down after that, but the period would end, 2-0. In the 2nd, the Wild struck again as some nice passing plays with three Wild players in front of the Hawks net this time, saw Nino Niederreiter deposit a puck beyond the outstretched Crawford for a 3-0 lead. 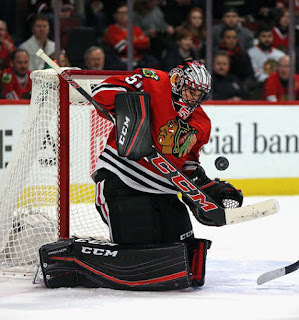 Half way through the period, a sad display as Crawford struggled to keep two Wild players from spearing at the puck to push it over the line, while Michal Rozsival, Viktor Svedberg, Andrew Shaw, and Artem Anisimov did NOTHING to help Crawford. 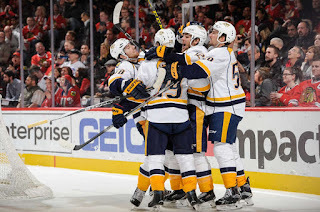 Shortly afterwards, Pominville received a pass from Niederreiter in the slot who buried it past Crawford for a 4-0 lead. Late in the period, a loose puck was played by Jason Tucker, who was then plastered with a shoulder by Rozsival. Tucker hit the ice hard when his head smacked against it. Rozsival left with a game misconduct penalty. The league will review it, but nothing should be done to Rozsival. Scott Darling came in to relieve Crawford in the 3rd period. 2:25 into the period, it was 5-0, Wild, as Ryan Carter, collected his own rebound and put it beyond Darling. Patrick Kane finally got the Hawks on the board with 8 minutes remaining, from an impossible angle. to make it 5-1, Wild. Coach Joel Quenneville decided to pull darling with less than 7 minutes remaining. a mid-ice pass from Kane was picked off by Erik Haula. As he strode towards the empty net, his legs suddenly gave way, and a penalty was called on the hawks, which resulted into a free goal for Haula to make it, 6-1. One would think with the exaggerated play by the Wild today, that Minnesota-alum, Dino Ciccarelli, gave the Wild a pep talk before the game. Notable Mentions: Not sure if there any. Michal Rozsival will get his first official hearing from the NHL League office for his hit on Jason Tucker. There were empty seats throughout the game in "The State of Hockey". There were 3 occasions where Dino Ciccarelli had to be feeling good on the exaggerations created by the Wild players during the game. Other than that, it's just another common February loss for our Blackhawks. Chalk it as a horrible loss, move on to the next game in 3 days. Artemi Panarin has shown up for big stage games before. 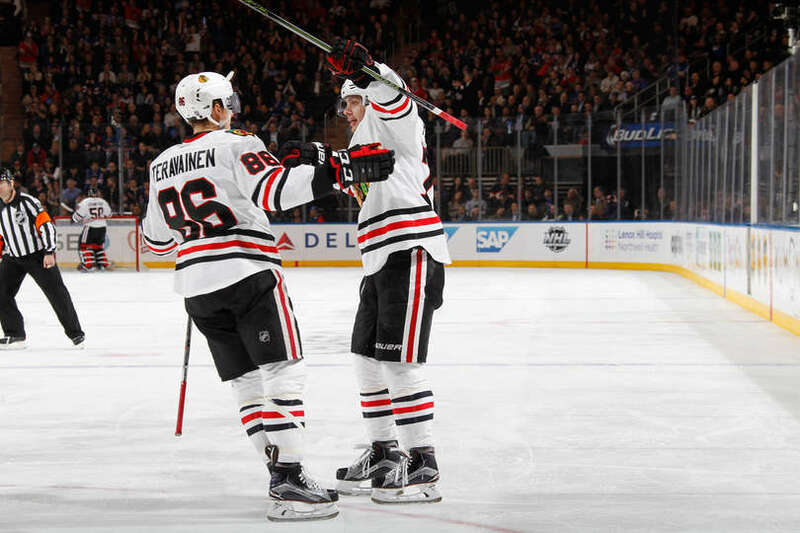 He outdone himself last night as he captured his first career hat trick as the Chicago Blackhawks beat the New York Rangers in Madison Square Garden, 5-3. Andrew Desjardins got the Blackhawks on the board early at the 3:30 mark as he received a sweet pass in front of the net from Teuvo Teravainen for a one-time tip-in past Henrik Lundqvist, for a 1-0 lead. Later in the period, the Rangers scored a goal, but had it reversed as Corey Crawford was grazed in the crease. This Coaches Challenge routine is fine, but as were the cases in the other two Blackhawk goal reversals earlier in the yea, this goal should have counted. At least the referees have been consistent. Consistently bad! Regardless, the Blackhawks skated to a 1-0 lead to end the period. The 2nd period scoring occurred half way through the period as Panarin scored the first of his 3 goals on a Blackhawks power play. With Artem Anisimov in front of the net, Panarin patiently picked his spot and slapped it past a clueless Lundqvist to give the hawks a 2-0 lead. 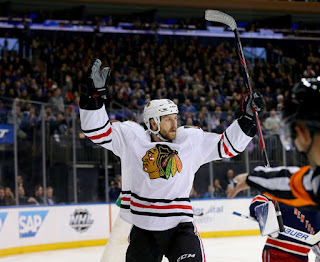 Three minutes later, ex-Blackhawk prospect, Kevin Hayes, got the Rangers on the board afther the Hawks lost a board battle and Hayes received a centering pass that made it through an outstretched Crawford to cut the lead in half, 2-1. At the end of the period, Vincent Hinostroza took an inadvertent double-minor, high-sticking penalty that wound cost the Blackhawks to start the 3rd. It didn't take long for the Blue Shirts to capitalize on the power play as Derrick Brassard found the back of the net :24 into the period to tie the game at 2. Because the Rangers scored within the first two minutes of that penalty, they still had another 2-minute power play. Dan Boyle would give the Rangers the lead as he slammed a rebound shot through Crawford for a 3-2 lead. Half way through the period, while on the power play, Andrew Shaw would receive the 2nd sweet pass for a goal that Teravainen setup on the night, to tie the game at 3. The Blackhawks 4th power play of the evening saw Panarin bury a shot from a centering pass by Patrick Kane to give the Hawks their 3rd power play goal of the night, and a 4-3 lead with just 3 minutes remaining in regulation. 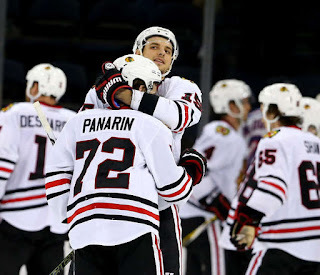 New York pulled Lundqvist for an extra skater, but Panarin would end their hopes as he completed his first NHL hat trick, or as I like to call it, a "BreadStick", 3 goals from the Breadman's stick, and seal a 5-3, Blackhawk victory. Notable Mentions: Artemi Panarin became the first rookie this year to break the 20 goal barrier this year. It's not every day this happens, but the Blackhawks scored 4 goals on just 19 shots (last goal was an empty netter) on one of arguably the best goaltenders in the NHL, Henrik Lundqvist. 11 of 18 skaters recorded a point for the blackhawks last night. One last milestone this evening, as little as it may be, this is my 100th post on this blog. I hope everyone has enjoyed what they have seen so far and thank you for your continued support. The Chicago Blackhawks were hoping for a boost to their lineup tonight as Artemi Panarin was back tonight from being ill as they took on a hot Anaheim Ducks team, who since Christmas, was 14-4-2. Brent Seabrook's two goals and Corey Crawford's 41 saves were not enough to beat the Ducks as the Hawks fell in overtime, 3-2. The 1st period was dominated by defense. Neither team scored, but Anaheim had more scoring chances. 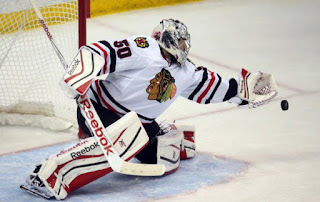 Crawford had to make a few tough saves to keep the game scoreless. The Ducks outshot the Hawks in the period, 13-7. In the 2nd, the defensive play continued. With 5 minutes remaining in the period, Hampus Lindholm hip-checked Marian Hossa and he landed awkwardly into the boards. Richard Panik replaced Hossa and on the following shift, he drew a penalty. On that power play, Brent Seabrook blasted a shot that was saved by Ducks' goalie, John Gibson. The rebound wound up going back to Seabrook who didn't miss the second time around to put the Blackhawks up 1-0, heading into the 3rd period. Jakob Silfverberg got the Ducks on the scoreboard during some 4-on-4 hockey 5 minutes into the 3rd period. Not long after, the Blackhawks having trouble in their own zone again, lost possession and David Perron snapped a shot from the slot past Crawford to give the Ducks a 2-1 lead. With 8 minutes remaining in regulation, it was Seabrook again with a blast that deflected off a defenseman that found the back of the net to tie the game at 2. So for the 3rd time this year, the Hawks and Ducks went to overtime. After not capitalizing on a breakaway, Patrick Kane took a Too Many Men On The Ice penalty, yes it was 3-on-3, and they still somehow took that penalty, amazing and as stupid as that sounds. The ducks took advantage of it and Ryan Getzlaf beat an outstretched Crawford for the game-winner. 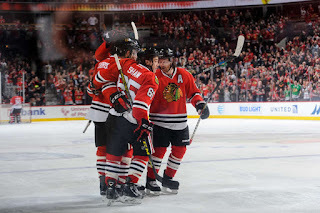 Notable mentions: Brent Seabrook's two goals gives him a new career high in goals scored for a season (10). Marian Hossa did not return after being hip-checked in the 2nd period. Joel Quenneville said that his injury was not worthy of a long period off. The showdown on Madison had the top two teams in the Western Conference battling for the 3rd time this year. 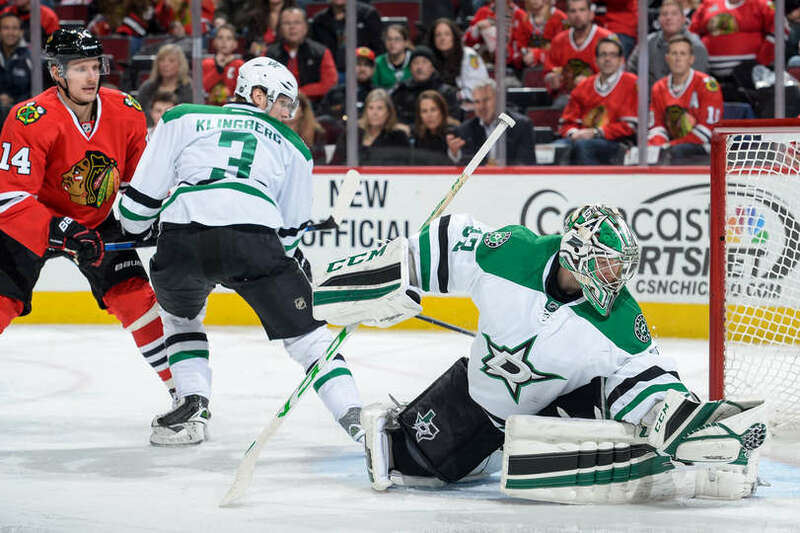 The Dallas Stars and Chicago Blackhawks had played two very lopsided games so far this year. Would this one be any different? Um...no. at least not to start. A 4-goal 1st period by Dallas was enough to hold off the Blackhawks, 4-2. Patrick Eaves must have eaten his Wheaties this morning as he scored three, yes 3, goals in the 1st period. That along with a goal sandwiched in-between by John Klingberg, the Stars bombarded the Hawks and led 4-0 after the 1st period. In the 2nd period, Scott Darling was brought in to relieve Corey Crawford. It worked, because Darling gave up nothing. Unfortunately, neither did Kari Lehtonen on the end of the ice for Dallas. The score stayed, 4-0. The 3rd period saw the Blackhawks come to play. They outshot the Stars, 21-2 in the period. Duncan Keith ricocheted a shot off of two Star players, :32 into the 3rd period to get the Hawks on the board. Seven minutes later, Patrick Kane off of the face off, blasts a shot past Lehtonen, to make it a 4-2 hockey game. It's amazing that the amount of rebounds that the Hawks had, they couldn't get more past Lehtonen. The comeback came up short. Notable Mentions: Artemi Panarin missed his 2nd straight game due to an illness. He was sorely missed again tonight. Patrick Sharp and johnny Oduya made their return to the United Center where they both received video tributes and standing ovations from the crowd. 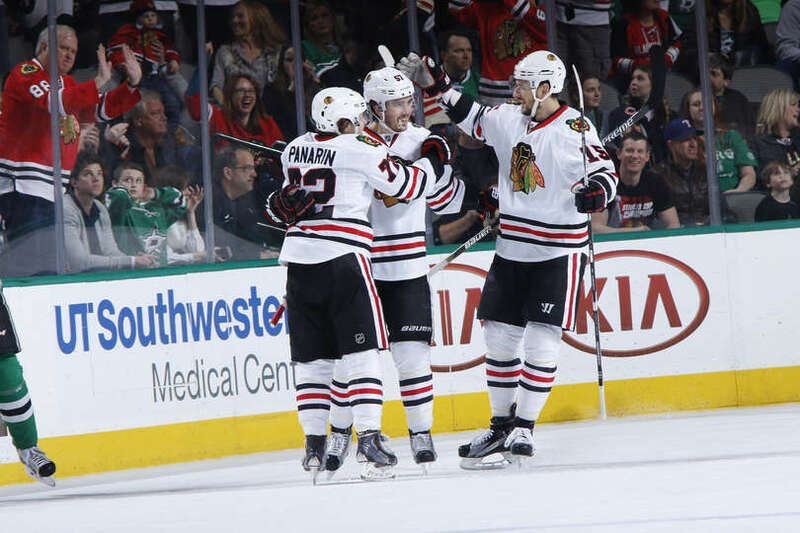 The Blackhawks now hold a 1 point lead over Dallas. Dallas has 2 games in hand. The Chicago Blackhawks came back home for the first time since 1/24 to their 357th consecutive sellout crowd as they took on the San Jose Sharks. The Blackhawks were without the services of Artemi Panarin, as he was ill. The rest of the team played like Panarin felt as they were shutout at home, 2-0. The only scoring of the opening period came from Brandon Mashinter. Unfortunately, it was a familiar setting as the goal was under review for goaltender interference. The result, the same as the previous goaltender interference challenge against the Hawks in Arizona, no goal. I honestly don't understand what these challenges prove when the players are not involved with deliberately making contact with opposing goalies. Joel Quenneville did not blow his stack this time. 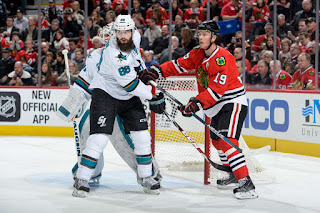 The period ended scoreless with the Hawks outshooting the Sharks, 10-8. 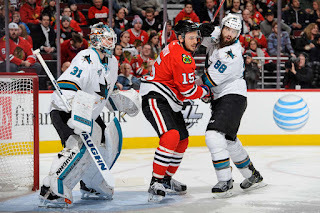 In the 2nd, the Sharks drew first blood as Patrick Marleau slapped a shot from the point that deflected off of Jonathan Toews midway to the net and found mesh, past Corey Crawford to give the Sharks a 1-0 lead. Martin Jones stood strong in net for the Sharks (33 saves on the night) as he gave very little rebounds in the 2nd as the Sharks took a 1-0 lead into the 3rd period. In the 3rd, Jones rejected every shot that the Blackhawks threw at him. The Hawks had 3 power plays and could not get one past Jones. The absence of Panarin made a difference as Teuvo Teravainen had a chance on the second line early in the game and did not produce. As did Richard Panik. As did Andrew Desjardins. Nothing went right for the Hawks tonight. They also had numerous shots that missed the net. Coach Quenneville's press conference after the game was short. When asked about the disallowed goal, his only comment, before storming off the podium, "It's gotten to a different level. I don't know the rules anymore, or something's changed. My understanding, -- I played a lot of hockey. I don't know. I think everybody has an interpretation, what's a good goal and what's a bad goal. But I can't believe it." Notable mentions: The San Jose Sharks added to their road wins as they now lead the league with 18 road victories. Patrick Marleau's 2nd period goal broke Corey Crawford's scoreless streak at 98:23. 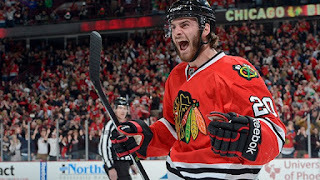 When "The Man-Child", Brandon Saad, 23, was traded to Columbus, Blackhawk fans erupted with hate and sorrow. 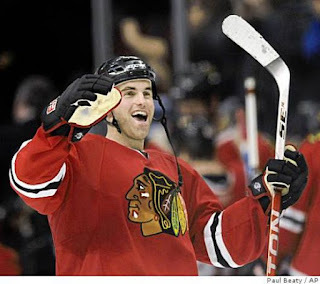 Saad was an original draft pick of the Hawks. He was one of the biggest contributors of two Stanley Cup Championships. It was hard to swallow. And who did the Hawks get in return? A center that had been in the league six years and never really became that Top Line Center a team needed, Artem Anisimov, 27. Also, packaged in that trade, a potentially good player in Marko Dano, 21, and a 4th Round Draft Pick. What the hell was Stan Bowman thinking??? If you are still questioning Bowman, well, maybe you need to climb out from under the rock you have been hiding under and pay attention to what he has done for this franchise over the last six years. But that is a story for another time. Brandon Saad is becoming the goal scorer that everyone thought he would be in Columbus. He currently has 35 points, 19 goals, and is on pace for 30. He has himself a nice, big, 6 year/ $36 million contract, in which the Blackhawks were never going to be able to match. He's young, represented Columbus in the NHL All Star Game this year, and will be a household name for years to come. 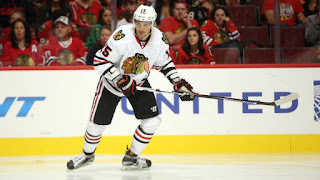 Artem Anisimov had been sought after for a long time by Bowman. The Blackhawks had not had a solidified number two Center in forever. He is 6'4", and a big presence in front of the net, which the Hawks haven't had since Dustin Byfuglien. Bowman was so happy to get him, he gave him a 5 year/$22.75 million contract extension the day after he traded for him. So how has this trade gone so far for the Blackhawks? Well, Anisimov, in 55 games has 32 points (18G 14A), +9, and is centering two of the top five scorers in the entire NHL, Patrick Kane (76 pts.) and Artemi Panarin (52 pts.). What he brings off of the scoresheet is a long reach to disrupt outlet passes. He is a big body that will battle in the corners and in front of the net (just check out the traffic in front on some of Kane's and Panarin's goals). He can play on the penalty kill unit (scored an SHG last night in Dallas). Possibly most importantly, he speaks Russian, which Panarin speaks exclusively, as he did not speak English when brought over to the Blackhawks. Communication between players is crucial when working as a team unit. You can compare points with Saad, but it would be apples and oranges. What Anisimov has brought to the Hawks has been huge, unlike his new contract hit, which will be $4.55 mil over the next 5 years, thank you Mr. Bowman. If you want to compare Saad to Anisimov, their salary cap hits is a huge factor (Anisimov, $4.55 mil, Saad, $6 mil). With the talent that the Hawks have, that difference in salary is huge. Oh and that Dano kid? He's seen 13 games with the Hawks (1G 1A), and is playing well down with the Rockford IceHogs, 30 games, 20 points (4G 16A), +15. No need to rush him. We'll be seeing plenty of him in the future. Both teams made out good and got what they wanted in this trade. We'll miss the "Saad-Father", but we will learn to, if not already, love "Arty". No, his nickname isn't as cool, but I'm sure a new one will blossom soon enough. 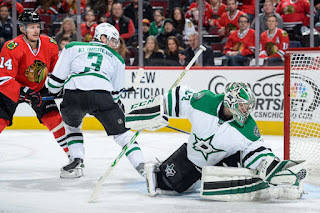 The Chicago Blackhawks finished up their 3-game road trip with a stop in Big "D" for some payback for an earlier, 4-0 drubbing, provided by the Dallas Stars back in late December. 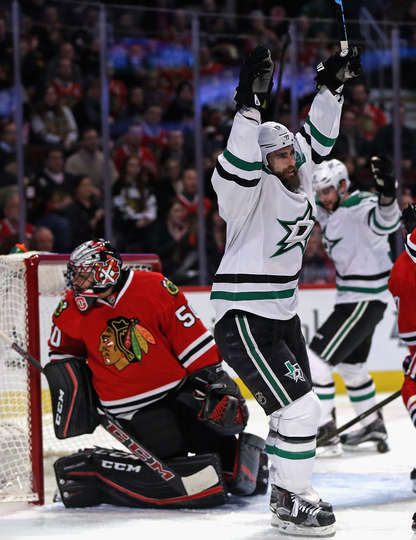 The Hawks delivered a statement game to the Stars and the rest of the league with a 5-1 romp over Dallas. Corey Crawford stopped 36 shots in the victory. The game was closer than the score at times, but the play of Crawford sealed the victory. The Blackhawks went to the power play :29 into the first period. The Hawks power play cashed in just :05 later as Brent Seabrook blasted a shot past Star's goalie, Antti Niemi for a quick, 1-0 lead. Later in the period, during 4-on-4 play, Trevor van Riemsdyk took a bouncing rebound and slammed it past Niemi to extend the Hawks lead to 2-0. Dallas came right back, just 1:20 later, as Jamie Benn's shot grazed the goal post and the rebound was buried by Tyler Seguin to cut the lead in half, 2-1. While short-handed, and with one minute remaining in the period, Jonathan Toews performed a highlight reel move that was capped with a Marian Hossa goal to give the Hawks a 3-1 lead heading into the 1st intermission. In the 2nd, the Stars peppered Crawford repeatedly and he stood tall rejecting all 18 shots in the period. 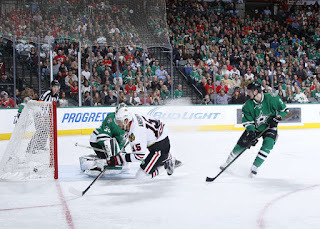 Midway through the period, while on a Dallas power play, the Blackhawks struck gold again as Artem Anisimov scored short-handed past Kari Lehtonen, who replaced Niemi to start the period. Near the end of the period, Patrick Kane got into the scoring act as he went top shelf and stretched the Hawks lead to 5-1 to end the 2nd period. In the 3rd, the Blackhawks played defense and did not focus on offense as they only mustered 3 shots in the period. They gave up 10 in the period, but as the norm, Crawford denied them all. 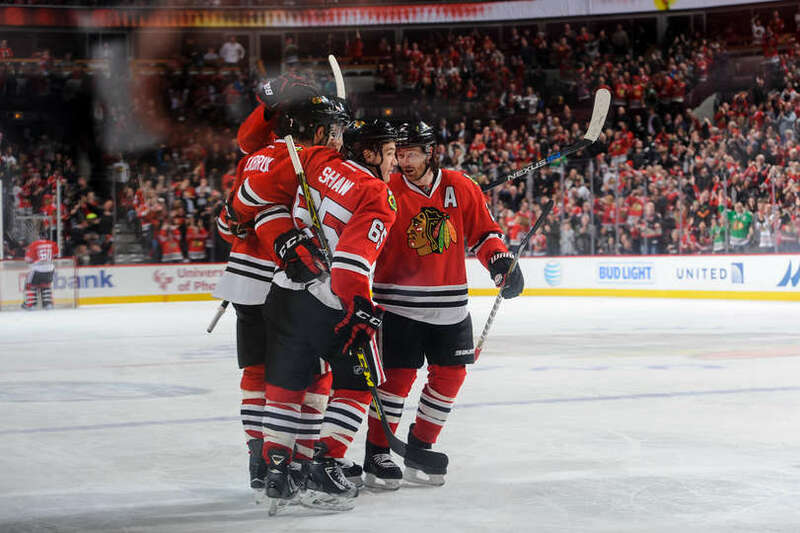 Notable Mentions: Brent Seabrook's 8th goal of the year tonight is one shy of his career-high. Marian Hossa's goal tonight gives him 496 for his career. Jonathan Toews' assist on Hossa's goal was his 300th of his career. Andrew Shaw played in his 300th career game tonight. The second stop of a three game road trip found the Chicago Blackhawks in Glendale, AZ tonight to take on the Arizona Coyotes. The Blackhawks got their captain, Jonathan Toews back for the game. It took the Blackhawks nearly 12 minutes to get their first shot on goal. Then, Marian Hossa had scored a goal, only to have it denied for a very questionable goaltender interference call. Klas Dahlbeck pushed Hossa into Coyotoes goalie, Louis Domingue. Coach Joel Quenneville was so livid, he earned a misconduct penalty for 'expressing his thoughts' after the disallowed goal. Then, on that power play, Arizona's Oliver Ekman-Larsson scores and puts the Coyotes up, 1-0. What wasn't called on that play, was that Arizona's Mikkel Boedker pitchforks Hossa that gave Arizona the odd man rush that led to the go ahead goal. A blown call, and an Coyotes lead after 1 period. Odds were that the Blackhawks were going to come out flying in the 2nd. It would have been a good bet. Marian Hossa scored again, this time it counted, to tie the game at 1 with a power move to the net that beat Domingue. The Hawks would then have to kill a PK, but while doing so, 1:07 after their last goal, Hossa's cross-ice, backhand pass to Toews, found its way to the back of the net to give the Hawks the lead, 2-1. Andrew Shaw then took a stupid penalty which negated a power play. Arizona would score on their power play as Boedker snapped one past Crawford. Nine seconds, yes, nine seconds later, the Coyotes strike again as Jordan Martinook finds a rebound and pokes it in the net to give the Coyotes, a 3-2 lead. Patrick Kane decided enough was enough, as he received a beautiful pass from Artemi Panarin, and slipped it through Domingue to tie the game at 3. The crazy period would end, tied at 3. The Blackhawks came out flying in the 3rd and during some 4-on-4, Michal Rozsival tipped in a beautiful pass from Artem Anisimov to give the Hawks a 4-3 lead. With 8:30 remaining in regulation, Shane Doan with wraparound crawled up the stick of Crawford and into the net and tied the game at 4. The game would head to overtime where Mr. Overtime, Jonathan Toews blistered a wrist shot from the slot for the game-winner with :29 remaining. 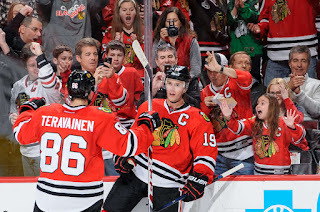 Notable Mentions: Jonathan Toews now has 8 game-winning goals this year, 5 in OT. Michal Rozsival's goal was his first in 14 months. Marian Hossa's goal was his 495th of his career. Patrick Kane's 31st goal was a new career high in the regular season. Artemi Panarin's 3 assists tonight now give him 50 points on the year (18G 32A). The 2nd half of the NHL hockey season began for the Chicago Blackhawks as they started the 1st of a 3-game road trip in Denver to face the Colorado Avalanche. 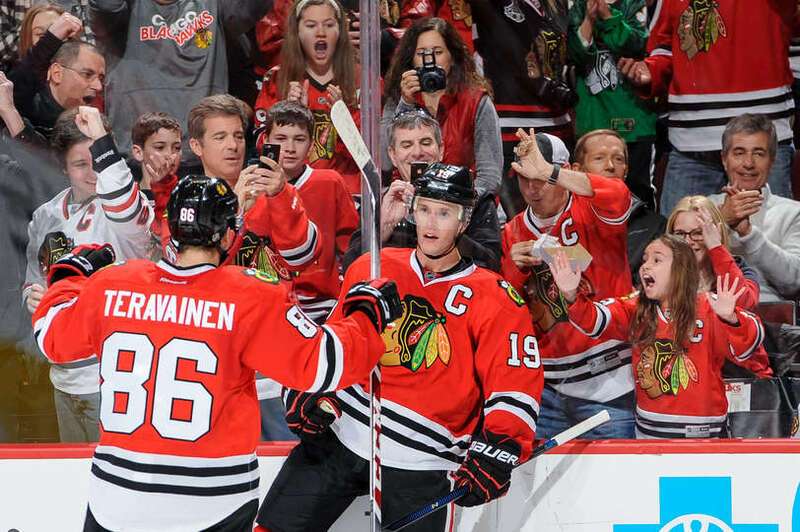 The Blackhawks were without Captain, Jonathan Toews. Due to him being sick, he missed the All-Star Game, resulting in a 1 game suspension. That didn't stop the Blackhawks as they beat the Avs, 2-1. 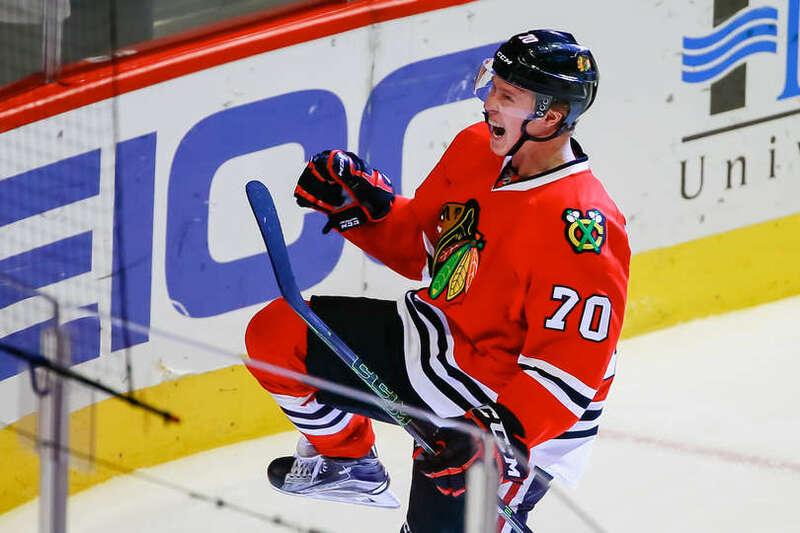 The Blackhawks wasted no time in getting onto the scoreboard as Richard Panik took a centering pass from Andrew Shaw and popped it past Avalanche goaltender, Calvin Pickard giving the Hawks a quick 1-0 lead, just 2:57 into the game. 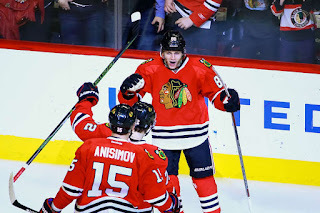 Artemi Panarin would add to that as Patrick Kane connected with "The Breadman" with a backhand shot that bounced off a defender and into the back of the net to make it, 2-0, Blackhawks. The Avs would come back as Gabriel Landeskog would find a loose puck in the slot and he snapped it past Corey Crawford to cut the lead in half, 2-1. The period would end that way with the Blackhawks outshooting the Avs, 15-7. In the 2nd, the Blackhawks controlled the puck for the majority of the period. In fact, they outshot the Avs 15-2 in the period, but had nothing to show for it thanks to the play of Pickard. 2nd period shot totals favored the Blackhawks, 29-8. The 3rd started with the Avs doubling their shot total within 4 minutes of the start of the 3rd period. Crawford had to stop a barrage of shots as the period began. Panarin had a chance to widen the lead as he walked in on a breakaway, but Pickard was there to make the save. Crawford made two more huge saves as the period went on to preserve the win for the Blackhawks. He would stop 23 for the game, 16 in the 3rd. Notable mentions: Richard Panik's goal was his 3rd, as a Hawk, in 9 games played. 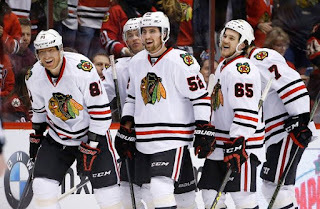 Viktor Svedberg made a return to the Blackhawk lineup for the first time since Novermber 12th. He assisted on Panik's goal. 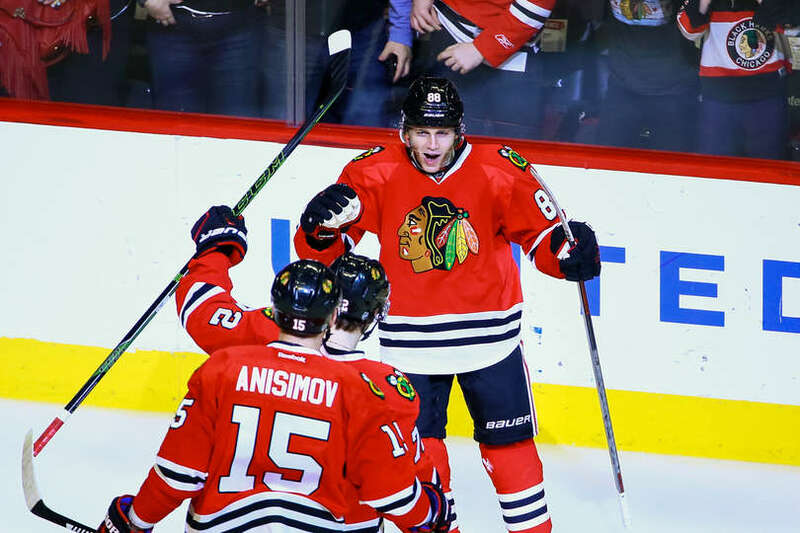 Patrick Kane has assisted on 16 of Artemi Panarin's 18 goals this year.